Workers in other countries can crush the workers in S'pore very easily. Past few days have seen a flurry of reports about the "much vaulted S'pore workforce". I love the polls by Gallup(independent). It is helping to 'awaken' the sleeping masses indoctrinated about gdp growth by the ruling hybrid regime. SG is least emotional country in world. 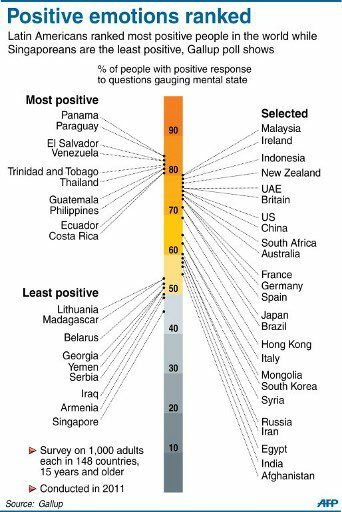 Sinkies least positive in world. Top 3 most common excuses: Headache/giddiness (41.5%), diarrhoea/food poisoning (18.3%) & stomach cramps (10.7%). Many workers in S'pore have 14 days of annual leave or less. Coupled with long hours--->burnout. MCs are an outlet for employees to avoid using the precious 14 days which are usually reserved for vacations. Bus drivers hired from China by SMRT for their cheap wages encashes their annual leave for $$$. It is the same for lowly paid sinkies & i've done it as well when living costs are rising relentlessly. I was burnout at end of year without taking any MCs nor annual leave. Smart bosses would reward workers for not taking MCs every month. It causes less disruption to work processes & staff morale. In 2012, 41% of establishments offered at least 1 form of work-life arrangement, up from 38% in 2011. Working part-time was most common work-life arrangement offered by 33% of companies. Distant 2nd was flexitime (8.2%), followed by staggered hours (7.5%) & tele-working (4.0%). 5-day work-weeks continue to be the norm, with 44%. Shift work (17%), 6-day (18%) & 5-1/2-day work-week (14%). Is utter pathetic that working part-time is considered as work-life arrangement. In this internet age, tele-working ought to be more to elevate time wasted in traffic jams, pollution & congested lunch crowds. 5, 5.5 or 6 days is not an accurate indicator. No. of hours work should be. No point having a 5 day workweek when the workers is approaching burnout working 10hours a day. 7 in 10 are still intending to change jobs in 2013. Salary & job advancement identified as top pull factors for job change. Majority of 550 respondents singled out 1st quarter as best time to start a job hunt. 1st quarter = crowd mentality. It is the period when competition is strongest.